Blinkist began in 2012 as a book insight service that would help people read more despite the obstacles that come with busy modern lives. Since then, we’ve grown from a team of four to a force of forty, with a library of 1,500+ books-in-blinks and audio versions to match. As we’ve grown, we’ve learned that our love of nonfiction books speaks to something much bigger—and ultimately, much closer to our hearts. We believe that knowledge should be presented in a way that makes a complex idea so clear that it’s meaningful in seconds and applicable in just a few more. We’ve also seen first hand how the right idea at the right time can be exactly what you need to start a new business, to get a new job, to heal an important relationship, or to change your own mind in a way that changes everything. Four years in, we’re more committed to what we do than ever. We believe that big ideas should be accessible to everyone—and we’re here to bring them to you. We started out with the hypothesis that our users were business people who wanted to read more, faster. A lot of you fit that profile, but a lot of you decidedly don’t. You’re grandmothers in Northern England and entrepreneurs in Brazil; you’re students in Finland and HR managers in Southeast Asia. You’re working moms in New York City and teachers perched on Himalayan mountaintops. You told us that Blinkist helps you find out more about what already matters to you, but that it’s also helped you discover new topics and put your world into context. You’ve been honing your marketing skills and finding out what makes crows so smart. You’ve learned to take better care of your mind, your body, and the people you care about. You’ve been figuring out how to make your good habits stick and getting better at forgiving yourself when you take a day off. You are so much more than what we expected—and you’ve been using Blinkist for much more than reading. You use Blinkist to hone your professional skills and understand your world. You also treat us as your companion on the most noble, challenging journey we know: fulfilling your human potential. 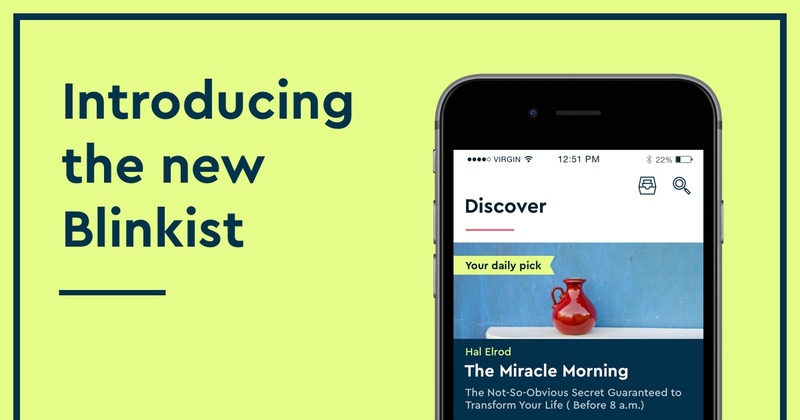 You use Blinkist to become a better you, so we thought that it was time to give you a better version of us, too. The new Blinkist logo represents exactly what we do: we come together to dive into a world of complex ideas, then filter, distill, and refine them into an essential core that’s small in size, but huge in impact. The white space behind the Blinkist pod is the outer world where knowledge from many different fields and thinkers swirls. The green is us, funneling it into a rich, potent heart of an idea, represented by the blue drop. We love it, and we hope you do, too. • With a single tap, the new Autoplay feature lets you listen to your whole library while you’re going about your busy day. 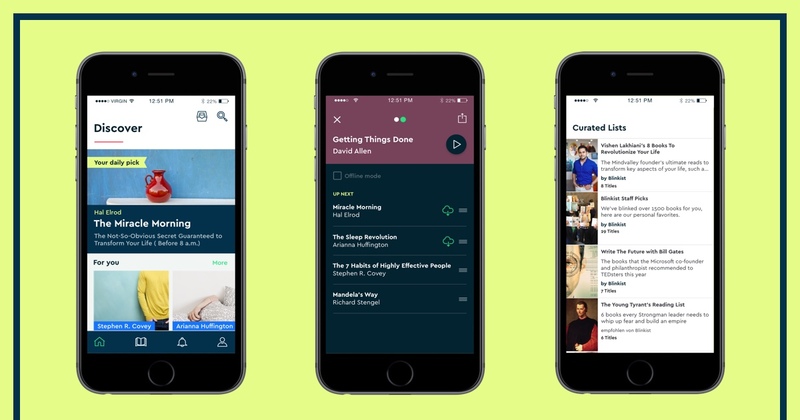 •The Discover feature is also completely re-architected to help you explore things you love by topic or uncover new passions. •We’ve also adjusted our recommendation system so that you can easily find more of what matters to you. •And now, it will be even simpler to find a great idea and make it your own: you can organize what you learn with an improved tagging system and highlight the portions of the books-in-blinks that mean the most to you. Of course, you’ll also notice a fresh new look—more color, more emphasis on photography, and a new primary typeface that looks as confident and bold as you feel when you learn something new. You come to us to boost your skills and gain new perspectives, so we’ve got plans to improve the app and our content offering to help you do it. And of course, we’ll keep bringing you the widest variety of nonfiction knowledge in a form that fits your lifestyle. We are honored to keep you company on your personal quest to become the best you, and we’re excited to learn more and do more together. A lot has changed in four years, but the reason we all get up and come to work every day to develop and design, to read and write and dream, has stayed the same: we believe that big, inspiring ideas are for everyone. Come and let us show you what we mean.